Why do pet dentists (or veterinarians who also take care of dental issues) suggest anesthesia? Imagine if your dentist lifted your lip, took a quick scan around your mouth and excused you from the dental chair in a minute or two. Some people might be delighted, but most of us would look for another dentist. The same should go for dogs and cats. Considering that most pets have some kind of dental disease by the time they’re three years old, dental exams and cleanings should rank higher in importance. Especially when dental disease can lead to pain, difficulty chewing and bacterial infections that can spread to other organs. Not to mention breath that can clear a room. 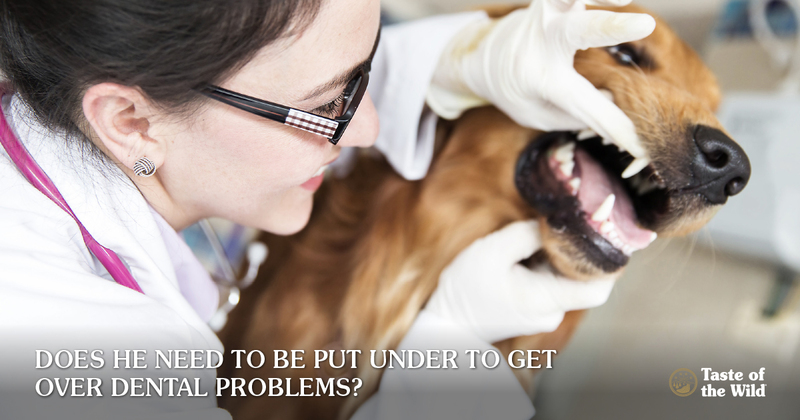 That’s why a short inspection of your pet’s teeth isn’t enough to determine his or her dental health. And why a pet dental exam or cleaning on a squirming pet isn’t safe for your pet or the veterinarian. Yes, general anesthesia really is necessary for a thorough and comfortable cleaning. At least 60 percent of your pet’s tooth structures are under the gum line, so it makes sense that a lot of dental disease is there, too. Plaque can trap bacteria, creep along the tooth under the gum line and harden into tartar. Beneath the gums, the bacteria can go to town, forming abscesses, eroding the bone and creating deep pockets that can lead to pain and tooth loss. To properly examine each tooth and assess what’s going on under the gums, your veterinarian needs to probe around each tooth and take dental X-rays — just like your dentist does. And very few dogs and cats will sit still for that. With general anesthesia, there’s less stress on your pet and your veterinarian can do a better job of evaluating your pet’s mouth. Even though you brush your own teeth twice a day, you can’t keep up with the plaque and tartar, so regular dental cleanings are a must. For dogs and cats that don’t always get the benefit of a daily brushing, professional veterinary cleanings are even more important. Once plaque hardens into tartar, it can be impossible to remove with a toothbrush alone. But when your pet is under anesthesia, your veterinarian can work to dislodge plaque and tartar above and below the gum line and polish the teeth. At the same time, he or she can take dental X-rays, which can help detect problems like feline resorptive lesions (similar to human cavities), abscesses and bone loss. Your veterinarian can also probe the teeth for pockets, remove or repair painful, fractured teeth and explore the mouth for any abnormal growths. Of course, every medical procedure has risks. But advances in anesthesia and monitoring make the procedure safer than it has ever been before. And pre-anesthetic blood tests can help your veterinarian know if there are any health conditions that require adjustments to the anesthesia protocol or even need to be addressed before proceeding with a dental exam or cleaning. With general anesthesia, your veterinarian can do a better job of protecting your pet from dental disease and other health problems. Your pet can relax during the procedure and wake up with a cleaner, healthier mouth. And you can appreciate your pet’s fresher breath the next time he or she is snoring on the pillow next to you.